Still not sure if you are able to run our system? Submit your question to us! To verify that your computer settings are compatible with our System Requirements (see above), click the computer settings button below. Update your computer settings as required. Turn off your pop-up blocker using the browser-specific guidelines below. Once your training is complete, we strongly recommend that you turn your pop-up blocker back on by reversing the steps you followed to turn your pop-up blocker off. IMPORTANT If you continue to receive a message to turn off your pop-up blocker after you have turned it off in your web browser, then there could be a browser add-on or anti-virus software that also has a pop-up blocker that needs to be disabled while taking the course. Click the Tools button in the menu bar. In the Privacy tab, ensure the Turn on Pop-up Blocker checkbox is unchecked. In the menu bar, click the Tools button. Step 3 is the same for both methods. 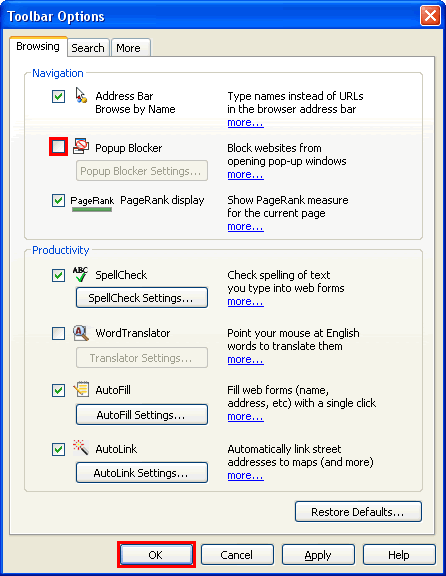 On the menu bar, click the Firefox menu and select Options, or click Tools and select Options. In the content panel, uncheck Block pop-up windows. Scroll halfway down the page and you'll see 'Pop-ups'; click Allow all sites to show pop-ups. Click the Google logo on the Google toolbar and select Options. In the Browsing tab, uncheck the Pop-up Blocker checkbox.